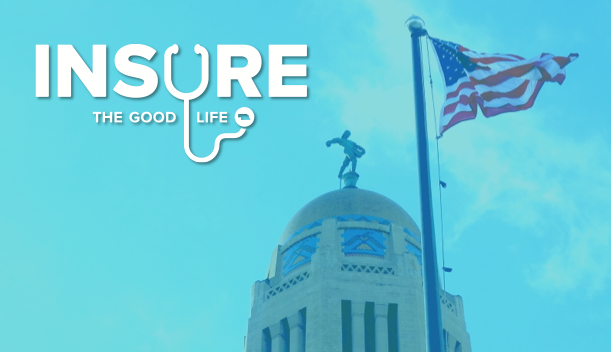 Nebraska AIDS Project – Insure The Good Life and Help End AIDS – Advocate for LB 1032!! Insure The Good Life and Help End AIDS - Advocate for LB 1032!! Insure The Good Life and Help End AIDS – Advocate for LB 1032!! Nebraska once again has an enormous opportunity to not only deal a knockout blow to HIV, but to level the healthcare playing field for thousands of low income Nebraskans. It’s time to Insure The Good Life. Right now, 97,000 Nebraskans can’t get health coverage because they don’t qualify for Medicaid and can’t afford private insurance. On January 19th, State Senator John McCollister (Omaha) introduced LB 1032 – The Transitional Health Insurance Program Act, a bill to help these Nebraskans including many people living with HIV, get the insurance they need and return dollars to our state economy. All of us at Nebraska AIDS Project want to thank Senator McCollister and all his co-sponsors for putting forth this legislation. We urge you to contact your State Senator and ask them to support LB 1032. Find your Senator HERE. WHY LB 1032 IS SO IMPORTANT TO PEOPLE WITH HIV? In Nebraska, low income people living with HIV can’t afford private health coverage and current law requires them to wait until they are disabled to qualify for Medicaid. Wouldn’t it make sense, and save a lot of money, if we treat people before they become disabled and prevent them from becoming disabled? Insuring the good life through LB 1032 will do exactly that for people living with HIV. Early treatment not only prevents transmission – it’s cost effective. LB 1032 would be a major victory for people living with HIV and countless others who have been shut out of the current health insurance market. It remedies one of the cruel realities of the AIDS crisis by allowing Medicaid access to low income, non-disabled people living with HIV who cannot afford private insurance on their own. The Transitional Health Insurance Program Act ensures access to the reliable health coverage that people living with HIV need to maintain continuous care, without the stress of interruptions in their care caused by inadequate coverage or an inability to pay. Research shows that, with early access to HIV treatment, people stay healthier and are 96% less likely to transmit the virus to others. Access to care is critical for people living with HIV. Last year, the Journal of the American Medical Association (JAMA) published research showing 91% of new HIV infections stem from people not receiving HIV care. States that have expanded health care access have achieved tremendous progress in the journey to end HIV/AIDS. Almost two-thirds of people living with HIV in Massachusetts have the illness fully controlled. Floor debate for LB 1032 starts Tuesday, March 29th – contact your State Senator and voice your support for the bill! Want to help? It’s easy! Send an email to your State Senator and ask them to support LB 1032. Find your Senator’s contact info here. When LB 1032 passes, it will be a great day for all Nebraskans, especially so for those living with HIV. We will be one step closer to ending AIDS once and for all! Contact me at jordand@nap.org if you have questions!